Tuesday President Obama gave the State of the Union annual address. He spoke on health care stating, "Instead of re-fighting the battles of the last two years, let's fix what needs fixing and move forward." He challenged Republicans to help him improve the health care law; and, offered to help them make two changes, adding medical malpractice reform eliminating an unpopular paperwork requirement for small businesses. Medical malpractice reform has been in the works for a while, with Republicans and Democrats butting heads on whether to have fixed caps on damages or not. However, both agree that something has to be done for the approximately 98,000 people a year who die from preventable medical errors. Also, with Obama’s suggested changes, small businesses would no longer have to file 1099 forms for payments $600 or more. He insisted he’ll fight repeals to prevent going "back to the days when insurance companies could deny someone coverage because of a pre-existing condition" and he explained how the law is already helping seniors pay for their prescriptions and young adults continue to be on their parent’s policies. President Obama also stated he is open to small changes and will consider new ideas to bring down health care costs, urging that repealing the law would increase the federal deficit by $230 billion over the next ten years. Also, during the State of the Union, the President called for more cost-cutting in Medicare and Medicaid. Critics fear Obama is not listening to what Americans want which is repeal, not just small changes. While still others commended him for saying he is open for changes. How do you feel about President Obama’s stand on health care reform in the State of the Union? Do you think he is open enough for change? Wednesday the White House issued a renomination of Dr. Don Berwick as the head of the Center for Medicare and Medicaid Services. Republicans, who strongly opposed him being nominated last year, dislike his controversial view in support of the British health system, supplying “eyes open or closed,” and question his qualifications and background. However, Berwick has received strong support from most major medical associations. Berwick will face a hearing in the Finance Committee as well as a confirmation by the full Senate before he becomes the head of the CMS. So far, it looks to be a difficult nomination process for him. Do you like Dr. Don Berwick for the head of the CMS? Do you think he will pass the nomination process? by John Hambrock for The Cartoonist Group from "The Brilliant Mind of Edison Lee"
If you were busy in 2010, 2011 will be even busier! Make sure you have the right tools. Update your Med Supp materials for Mutual of Omaha, Forethought Life, Gerber Life, Sentinel Life, and Woodmen of the World/Assured Life to reflect the 2011 co-pays and deductibles. The healthcare dispute restarted this week in Congress with a two day debate. Two minute speeches by both Republicans and Democrats were given, explaining where they and their party stand with the Health Care Law and the repercussions such law could have on the physicians, patients, and the American deficit. Republicans argue it will eliminate 1.6 million jobs and Democrats say it will create jobs. However, both are correct possibilities, some jobs might be eliminated by employers fearing high insurance costs; at the same time, other people will be hired to run the new health care programs. Another dispute is the national debt, which Republicans argue will create more national debt and the Democrats say the health care laws will reduce the deficit by $230 billion in the next 10 years. With the deficit, the truth lies in whether Congress can control Medicare and Medicaid spending, which could lead to lower physician payments and healthcare provider restrictions. The Republican’s strongest argument is that by insuring those who are currently uninsured will be too costly for some small businesses and taxpayers; whereas, the Democrat’s strongest argument is consumer protections, like keeping children on their parent’s insurance until they are 26. On Wednesday the House voted to repeal the Democrats’ health care overhaul. The Senate has reported they will not act on the repeal, effectively destroying it. In the meantime, House Republicans are working on a “repeal and replace” strategy to control health care costs and expand coverage. What do you think are the strongest arguments for or against the Health Care Law? When do you think House and Congress will come to a consensus? Brian Tracy, author of Psychology of Selling, which has become a bestselling audio program on sales, was interviewed by Paul Feldman for the January 2011 issue of InsuranceNewsNet. In the interview Brian Tracy shares his how-to’s of improving your business and your life. Tracy first states that time management separates winners in the sales market from losers. When you get more done, make more calls, and close more business you are deliberately managing your time. His tips are to plan your day in advance, prioritize your list, choose the most important task, and start the most important task and work until it is complete. This will give you a sense of personal accomplishment, self-esteem, and self-confidence. Brian Tracy also explains his Law of Sales, stating that nothing happens in sales until the sale takes place. He encourages people in sales to manage the sequence of events and use the law of three. There are three things you do every day, no matter what your job is, that counts for 90% of your income. The key is to determine your three. He suggests making a list of everything you do in your day and then asking yourself if you could only do one thing on your list, which would contribute most to your income. Then complete the process twice more with the same question. He then explains that the most important tasks should be one key task and two support tasks, prospecting, presenting, and closing. Once you get good at those three you will be headed to success. According to Brian Tracy, reverse engineering by starting with the end in mind and figuring out who is the ideal client, niche audience, and then focusing on learning about them is another key to sales. As is the art of closing and identifying the pain the person has and the benefit of your product. Tracy says to give examples of people's success from you and how it benefited them; or, give examples of someone who didn't and what happened to them. He states that either a positive or negative story works. This personalizes the experience and makes clients more interested in purchasing from you. Lastly, Brian Tracy suggests you never stop studying and says two hours a day is best. He compares sales to an athlete. If an athlete decides to not work out, how long would they continue to be competitive? Additionally, if they lose a year of working out and then go back, they are years behind their competitors. People in sales need to continue to work out your mind in order to stay ahead of their competition. Have you heard of Brian Tracy? Have you ever attended one of his seminars or read any of his books? Effective January 19, 2011 please see the new release notification, rates, and application for Colorado. Details released for the Mutual of Omaha 2012 convention in Laguna Beach, CA based on the business you place with Mutual of Omaha as a Broker Producer (personal production only) between January 1 and December 31 2011. See the Mutual of Omaha2012 convention website for more information. As part of the new health care reform law that went into effect January 1st, a Medical Loss Ratio (MLR) was instituted stating insurance companies must spend at least 80% of premiums on medical expenses in the under-age market, with the remaining 20% being shared with administrative costs. These new health reform rules will cut insurance brokers’ pay by 50% in some cases, effecting nearly 470,000 under-age market agents. Reports show commissions will drop from 15 to 20% on plans to 4 to 10%; and, for Blue Cross which used to pay 15% on the first year and 7% on residuals the following years will now pay 5% for both. Meanwhile, Golden Rule, owned by UnitedHealthCare is offering their brokers a per application bonus, understanding the cuts in commissions. By 2014, even without the MLR regulations, consumers will be able to find and obtain health insurance plans easily on their own. Under new health care regulations insurance agents, negotiating rates for those with pre-existing conditions, will be unnecessary. Health insurance companies will no longer be able to deny coverage based on conditions; therefore, making under-age insurance agent less and less vital for sales. Also in 2014, almost 32 million Americans will have insurance under the health care laws and MLR will negatively impact the way the public uses health care, with potential job loss due to lower commissions at a time when consumers need the most help because of all the changes. Critics argue smaller companies may go out of business, agents will see more cuts in compensation, and there will be reduced service quality to the consumer. Supporters say that industries are always changing and compare the change in the insurance industry to that of travel agents. Even though a lot of people buy their travel arrangements unassisted online there is still need for a travel agent. Now under-age insurance agents will just have to find their niche in the new insurance environment. If you also work in the under-age market, have these lower commissions already affected you? Do you believe the result of MLR will be a drastic decline in service or do you think things will level off quickly, like with the travel industry? With the Baby Boomer generation turning 65 this year and nearly 10,000 American’s a day qualifying for Medicare benefits- now is a great time to be a senior market agent selling Medicare Supplements. 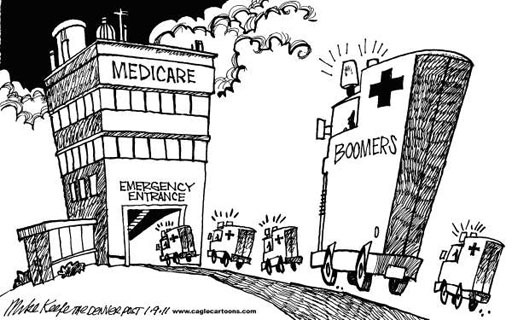 Has the influx of Boomers helped your Medicare Supplement business? How are you preparing for the boost in those interested in Medicare Supplements? As of the first of 2011 Medicare beneficiaries are able to go to one “wellness visit” a year completely covered by Medicare. This new part of the health care law reflects that medicine needs to focus on prevention rather than waiting until the patient is sick. Dr. Eddie Phillips, director of the Institute of Lifestyle Medicine at Spaulding Rehabilitation Hospital, has outlined what patients can expect at their wellness visit this year. First, the doctor will conduct a screening of a patient’s cognitive skills, depression, and risk of falling. They will develop a Personalized Prevention Plan talking about your diet, exercise, vaccinations, sleep, and stress; and, work to coordinate all of you caregivers. Also, you can choose to have a voluntary discussion of your end-of-life choices, getting a plan in place and having your wishes known. Dr. Phillips hopes this wellness visit will help people make lifestyle choices that will positively affect their health and health care costs. What do you think of the new “wellness visit” provided by Medicare? Have either you or one of your clients partaken of yours this year? Was it a valuable benefit? Foresters Prepared offers up to $300,000 in coverage with no medical exam and only a few health/lifestyle questions. It also offers extra-cost riders for disability income (accident only), waiver of premium (accident only) and return of premium. Contact PSM or call us 1-800-998-7715 to request information. New Medicare Advantage Disenrollment Period (MADP): MA members are allowed to make one change during this period of January 1, 2011 to February 14, 2011 with an effective date of disenrollment after January 1, 2011. Effective March 1, 2011 please see the rate increase notification for Iowa. This week the federal regulation allowing Medicare to pay for end-of-life counseling (also called “death panels” by critics) has been reversed, in order to make sure all of the stakeholders had a say in the decision. The regulation was passed in November but people were not allowed to comment until January 3rd. Under this reversal doctors can still talk to their patients about end-of-life plans; however, they will not be paid by Medicare for the discussion. Supporters say advanced planning should be included in Medicare’s new annual well visit, it is important to encourage those with Medicare to plan ahead, and the service adds value to the Medicare benefit. Those opposed say this discussion is highly personal and the government should not be a part of the process. This reversal comes a week before the House is set to vote to repeal President Obama’s health care overhaul. What do you think of this reversal? Do you think end-of-life planning is important or should the government stay out of it? Last week, CVS Caremark purchased Universal American’s Medicare Part D business for eight times the operating earnings. This buy-out more than doubles the size of CVS Caremark’s 1.2 million drug plan members; and, the addition of the 1.9 million that have United American makes CVS Caremark a major competitor in a short period of time. Universal American’s stock shares soared over 40% after the news of the deal was announced on Thursday, December 30th, and those stock holders can expect to receive between $12.80 and $13.00 per share for the business. Meanwhile, CVS’s shares values remain the same. The Universal American acquisition makes CVS Caremark a larger competitor to health insurers like UnitedHealth Group, Inc. and Humana, Inc. Also, the merge comes in time for the Baby Boomer generation to begin receiving Medicare benefits, the anticipated shift from employer coverage to Medicare in those who are retired, and Walgreens, CVS’s main competitor and the #1 drug store chain in America, trying to get out of the pharmacy business. Supporters of the acquisition also say that this merger will benefit CVS stores as well, with more people going into the store to pick up their prescriptions and possibly other items they might have gone elsewhere for otherwise. How do you feel about this buy out? How do you think this will affect your Medicare Part D business? Beginning Internet Prospecting: Do You Have Any Questions? It’s bound to have come up at some point in your agency business, either a client asks you for your agency URL, you’re looking for a new way to get leads, or you need a place to share all of your industry knowledge. In the last few years, the internet has completely changed the way we interact and it’s now vital for business to establish an up-to-date internet presence. Fortunately, it’s now easier than ever to get started. Several template-based, user friendly, Content Management System (CMS) website platforms are available for you to use, with little to no HTML or coding knowledge. We at Precision Senior Marketing use Hubspot; however, Joomla, Intuit, and Wordpress (as well as several others) are also good options. Or, if you do not have the time to create your website yourself, you can hire a graphic design or marketing firm team of professionals to create something completely custom to your agency. It is important to remember your website should be professional, give a great first impression, and be a reflection of who you are as an agent. New to selling Medicare Supplements? Mastering the art of Medicare Supplements is a great place to start. Once you have a website filled with content about you, your agency, your contact information, Medicare Supplement products, and possibly an online form for requesting a Medicare Supplement quote you need to spread the word about your online presence. One suggestion is Search Engine Optimization (SEO), which is a series of techniques used to have your website appear in searches. You might consider learning more yourself about the techniques involved or hiring a SEO professional to help you. Other suggestions are social networking (through Twitter, Facebook, ect), blogging, and Pay-Per-Click search. It is important to note that ranking in the top search engines does not happen overnight nor can you set a specific date as to when you will see the rankings you want. Search engines use a complex system of algorithms to determine which sites show up in which position. Keyword density, age of URL, and relevancy all factor in to making your site appear early in the search results for the keywords you are targeting. How has internet prospecting helped your agency? Do you have any questions about getting your own website, Search Engine Optimization, Pay-Per-Click, Social Networking, Blogging, or E-Blasting? Let us know in the comments! Questions submitted will be answered on future blogs. United of Omaha has proposed NEW Medicare Supplement rates for California, Colorado, Kansas, Maine, Nebraska, New Jersey, and South Dakota, tentatively effective 02/01/2011 (pending state approval). With Ultra-competitive rates, excellent commissions and a name your clients will know and trust, this is an opportunity you cannot afford to pass up. Partner with PSM and ensure you have the most competitive edge in the Senior Market. Request more information now or call 1-800-998-7715 for more information. Effective for all Louisiana applications signed on or after January 14, 2011 there are new rates for Sentinel Life Medicare Supplement LA and Sentinel Life Medicare Select LA. Call 1-800-998-7715 to get contracted with Sentinel Life.